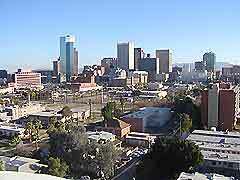 Phoenix, capital of Arizona, is one of America's fastest growing cities and enjoys more than 300 sunny days each year. 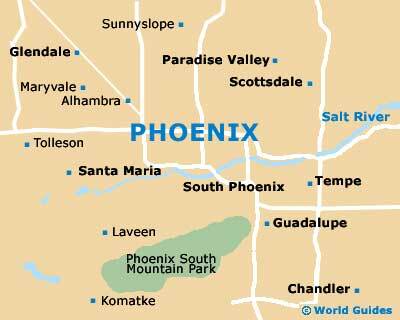 Now the six-largest city in the USA, Phoenix is located on the north side of the Sonoran desert and this spreading metropolis is connected by numerous strips and highways. Phoenix is a major tourist destination in the winter months, suiting holiday makers in search of sunshine and fine weather. The downtown area of the city is known for being a particularly vibrant entertainment district, containing one of the only baseball stadiums in America with a retractable roof. Nearby Phoenix, the Arizonan towns of Mesa, Scottsdale and Tempe are now top resort destinations in their own right. There are several tourism outlets within the city, with the most useful including the Downtown Phoenix Visitor Information Center on North 2nd Street, and the Biltmore Tourist Information Center, which is located within the Biltmore Fashion Mall on Camelback Road. Also of note and on the North Central Avenue are both the Mesa Convention and Visitors Bureau, and the Arizona Public Lands Information Center, the latter of which provides everything you could possibly need to know about state parks and land in the area. Hotels in Phoenix are concentrated around the city center and throughout the city's neighborhoods, with plenty of hotel lining the North Black Canyon, East Chandler Boulevard, North Central Avenue, South Pointe Parkway, South Street and West Wild Horse Pass Boulevard. Further accommodation lies close to the Phoenix Sky Harbor International Airport (PHX), which is situated to the southeast of the city center, next to the Pueblo Grand Museum and Cultural Park. More information about Phoenix Hotels. Phoenix has many splendid tourist attractions, including Chase Field - a major baseball stadium, home to the Arizona Diamondbacks; Castles -n- Coasters - a popular family orientated amusement park with an exciting roller coaster and many other fast other rides; Phoenix Zoo - expansive zoological gardens with large, natural enclosures; the US Airways Center - home to the Phoenix Suns NBA, Arizona Rattlers and Phoenix Mercury WNBA football teams; the Mystery Castle - an extravagant folk art mansion constructed in the 1940s from local recycled materials; and the acclaimed Desert Botanical Gardens - containing the world's most comprehensive collection of desert plants. Other major tourist attractions in Phoenix include the Arizona Capitol building - once the State Capitol and still a major American landmark, built in 1898; the Burton Barr Library - a distinctive modern building with areas clad in ribbed copper; the Historic Heritage Square - one of the last historic sites remaining in the area; the Wrigley Mansion - an Italian-style mansion, formerly the home of William Wrigley Junior, founder of the chewing gum empire; St. Mary's Basilica - a particularly attractive Roman Catholic church visited by Pope John Paul II; Patriots Square Park - situated in the very heart of downtown Phoenix, with a large performing arts stage; and the Mountains Park and Recreation Center - situated on the slopes of Piestewa Peak. 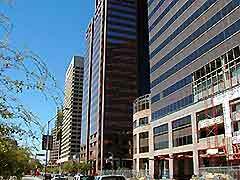 More information about Phoenix Tourist Attractions and Phoenix Landmarks. Phoenix also has many superb museums, including the Arizona Science Center - a particularly hands-on science museum with over 300 fascinating exhibits and general science information; the Arizona Museum of Natural History - one of the city's premier museums, housing a range of displays including animated dinosaurs and skeletons; the Phoenix Museum of History - full of detailed exhibits relating about the history of this city; the Arizona State University Art Museum (ASU) - an innovative art gallery known for its eye-catching architecture; the Phoenix Art Museum - featuring works of art from all over the world; and the Scottsdale Museum of Contemporary Art - boasting many rotating exhibitions of abstract works. 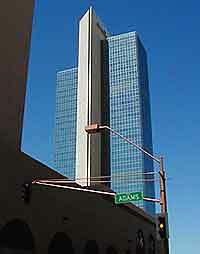 More information about Phoenix Museums and Phoenix Art Galleries. Tourist attractions located near to Phoenix include the Casa Grande Ruins National Monument - one of the largest prehistoric structures in North America, including many remaining earth-walled structures; the Apache Trail - a popular day trip from Phoenix, with stunning desert scenery and panoramic views of Fish Creek Canyon; Florence - just a short drive from Phoenix, featuring more than 150 sites named on the National Register of Historic Places; the Goldfield Ghost Town - lying between the Goldfield Mountains and the Superstition Mountains nearby Phoenix, with many historic buildings and regular mine tours; and the Historic Sahuaro Ranch - offering a rare glimpse into the region's rich agricultural past. More information about Phoenix Attractions Nearby.